Hang onto your glasses of pinot noir positive people, the Unbreakable Kimmy Schmidt is back on Netflix for an optimistic fourth season. Ellie Kemper's 'Kimmy', 'Titus' (Tituss Burgess) and 'Jacqueline' (Jane Krakowski) are all back, this time exploring a variety of new business ventures, but there's something different about this season, it will be split in two halves, the first six episodes dropping in May and the rest later in the year. This seems to be a trend at Netflix with Arrested Development's fifth season also split in two, sounding like a cunning plan to retain subscribers and not letting them binge entire seasons in one go. 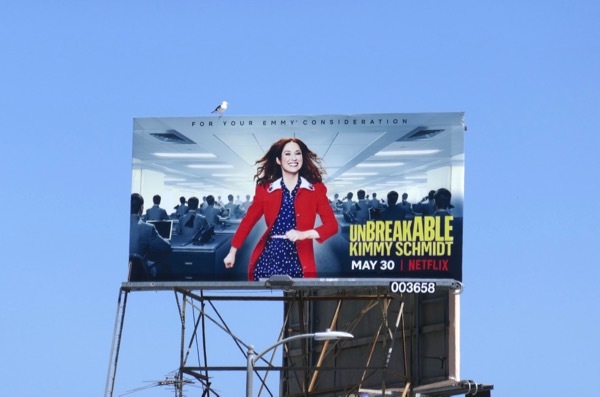 These season four billboards for the comedy were snapped above L.A.'s 3rd Street at Edinburgh Avenue on May 16, and later above Sunset Boulevard and Westwood Boulevard on May 28, 2018. 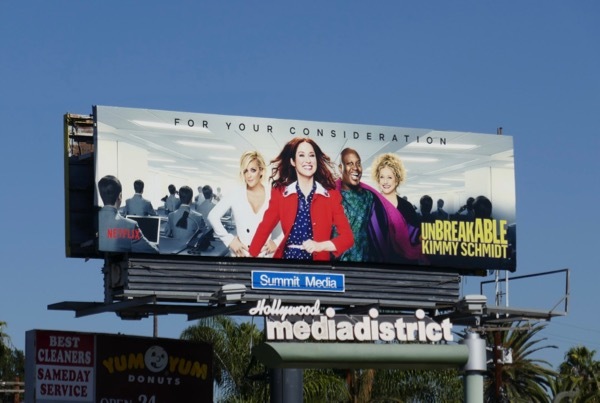 Fans of the quirky show can also enjoy all the previous fun season promo and awards consideration billboards for Unbreakable Kimmy Schmidt filling the city skyline in recent years. This fourth season is rumoured to be the last, possibly followed by a movie to wrap things up, so get your Kimmy fix while you can. You're sure to miss her effervescent personality when she's gone. 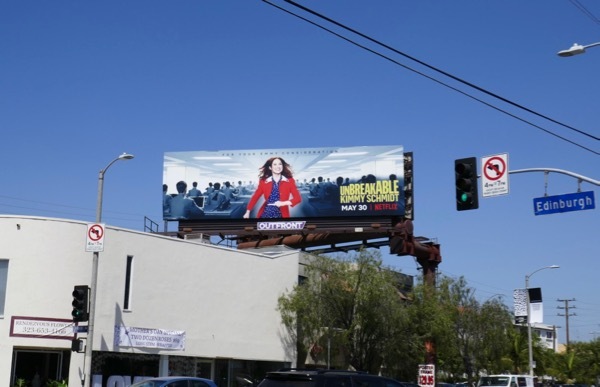 UPDATED: Here's also a 2018 Emmy consideration billboard for the fourth season snapped along Fairfax Avenue on June 1, 2018. 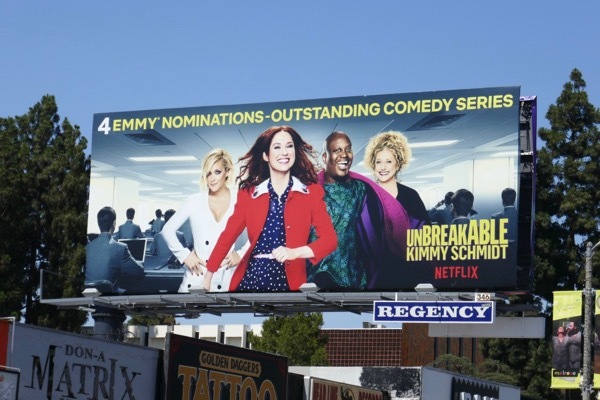 UPDATED: Congratulations to the Unbreakable Kimmy Schmidt garnering two (not four) 2018 Emmy nominations, for Outstanding Comedy Series and Outstanding Supporting Actor for Tituss Burgess, for the shortened half season. 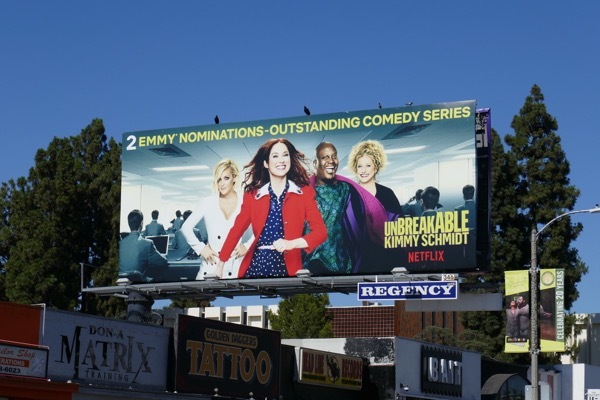 This Emmy nominations billboard was spotted along Melrose Avenue on July 25, 2018. 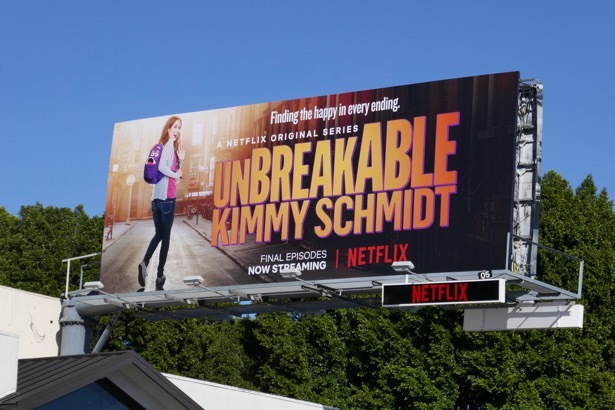 Plus here's also a corrected Netflix billboard with just two Emmy nominations. 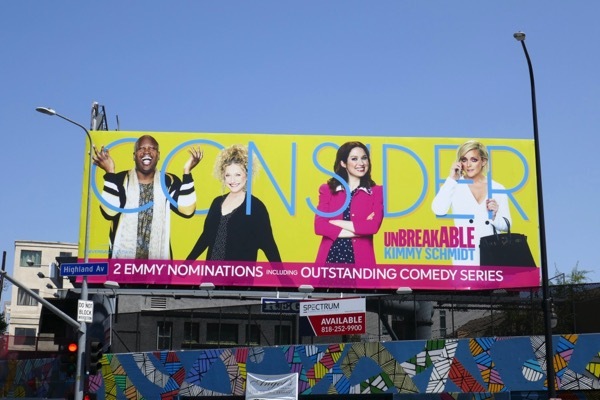 In addition here's the vibrant Universal Television Emmy nominee 'Consider' billboard spotted along Highland Avenue on August 12, 2018. 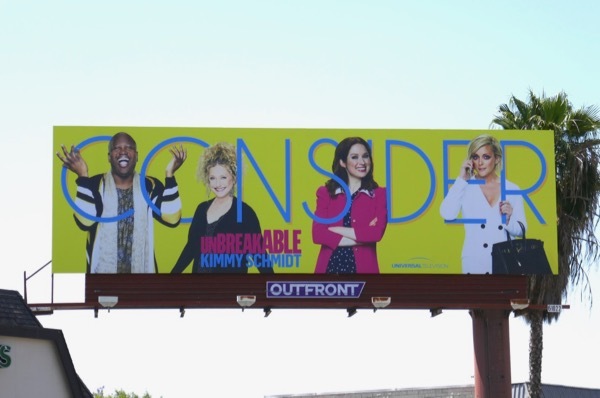 UPDATED: Sadly no Emmy wins for the first half of the fourth season, but maybe there'll be a Golden Globe or SAG Award in the show's future with the help of this FYC billboard spotted at Highland and Melrose Avenues on November 14, 2018. 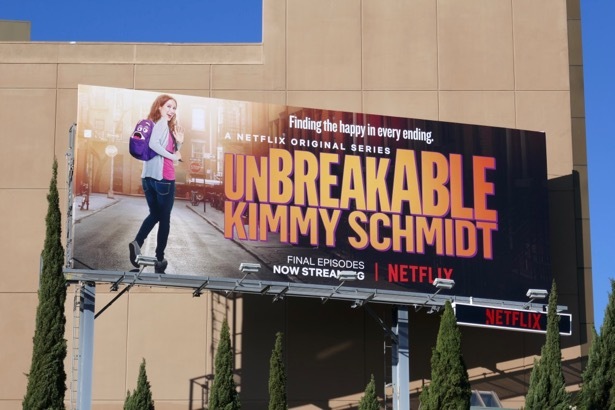 UPDATED: Are you ready to bid farewell to the irrepressibly optimistic Kimmy with the final episodes of her Netflix comedy? 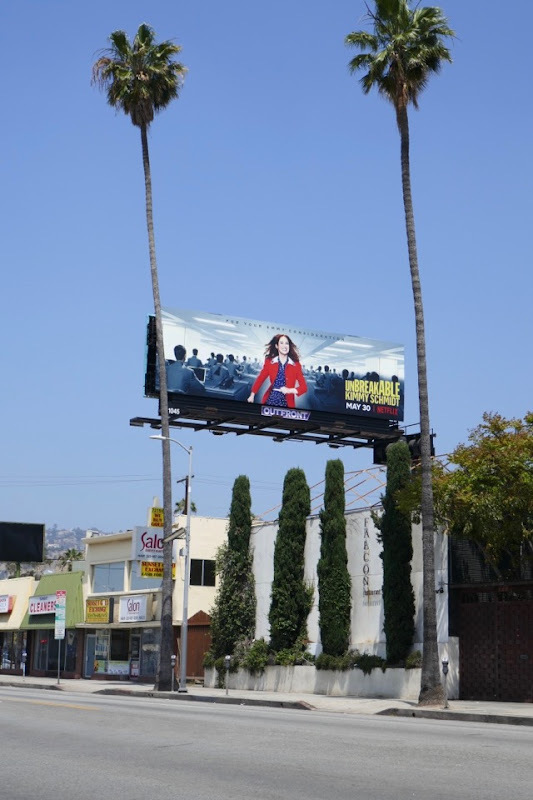 These billboards for the six final episodes in her fourth season were snapped along the Sunset Strip on February 6, 2019. Let's hope she does find her happy ending.